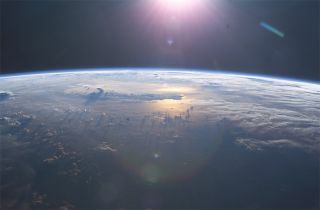 Sunlight falls on Earth's oceans. One of the least likely places you might think astronomers would learn about ancient supernovae is at the bottom of the ocean, but in new research scientists have done just that. Through the careful analysis of ocean sediment, tiny particles that originated from deep space have settled on the seabed, locking the chemical secrets to supernova processes that would have otherwise remained a mystery. "Small amounts of debris from these distant explosions fall on the Earth as it travels through the galaxy," said lead researcher Anton Wallner, of the Australian National University. "We've analyzed galactic dust from the last 25 million years that has settled on the ocean and found there is much less of the heavy elements such as plutonium and uranium than we expected." Supernovas are powerful explosions triggered when massive stars reach the ends of their lives. During these powerful events, many elements are forged, including elements that are essential for life to thrive — such as iron, potassium and iodine. However, as pointed out by an Australian National University press release, even heavier elements like lead, gold and radioactive elements like uranium and plutonium can be created. But it appears that the formation processes for the heaviest elements are at odds with current astrophysical theory. Plutonium-244 has a half-life of 81 million years, making it an excellent indicator of the number of supernovae that have exploded nearby in recent galactic history. "So any plutonium-244 that we find on earth must have been created in explosive events that have occurred more recently, in the last few hundred million years," said Wallner. But the fact that there is less recent deposition of the heaviest of elements, despite the fact that we know supernovae have erupted nearby, suggests a different formation mechanism may be responsible for plutonium-244 and elements like it. "It seems that these heaviest elements may not be formed in standard supernovae after all," concludes Wallner. "It may require rarer and more explosive events such as the merging of two neutron stars to make them." This research has been published in Nature Communications.